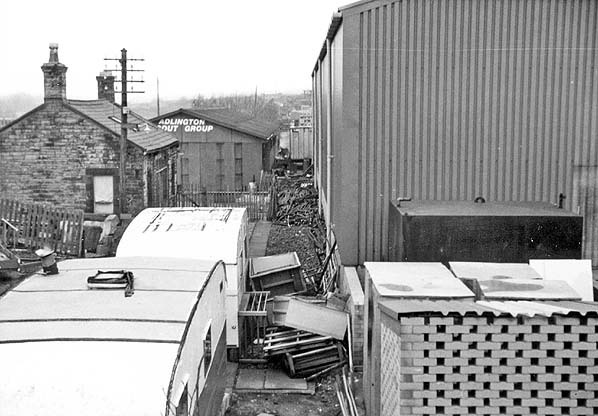 Present state: The booking office and shelter on the Chorley platform has survived the demolition of the station and is now used by Paramount Drylining Ltd. The rest of the station and goods yard has been obliterated! 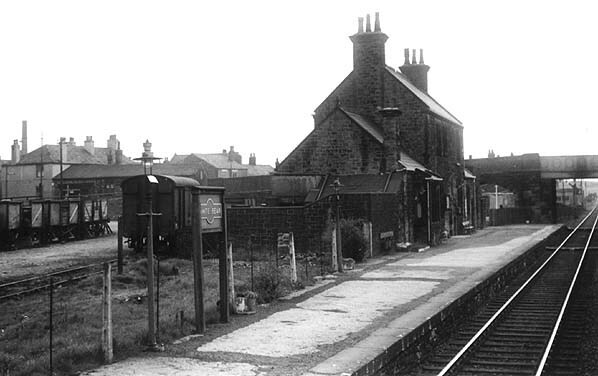 Notes: White Bear station was situated on the Lancashire & Yorkshire Railway (LYR) and the Lancashire Union Railway (LUR) joint Boars Head and Blackburn line which opened on 1 November 1869 for goods services. Boars Head was located on the London & North Western Railway (LNWR) main line that linked Wigan and Preston. The 6-mile joint line was constructed because the Wigan coal owners wanted better transportation links to the mills and factories of North East Lancashire. The coal owners also wanted a line that would allow trains to go south and gain direct access to Garston Dock where shipping charges were far less than at the Liverpool docks. White Bear station opened on 1 December 1869 when passenger services were introduced. The station was located on the western edge of Adlington just to the east of the Lancaster Canal. White Bear and Boars Head were two of the stations in Lancashire that were named after hostelries, with Nelson, Waterloo, Cherry Tree, Clock Face, Britannia, Old Roan, Old Swan, and Bay Horse sharing this etymology. The line was a double track railway and two platforms were provided. The main facilities were on the up platform (Wigan direction). The stone buildings were distinctive, repeated at Heapey, Withnell and Feniscowles stations on the LUR beyond Chorley. The central two-storey block under a pitched roof was given a commanding appearance by the provision of windows of similar heights on both storeys. It was flanked by single-storey wings, again under pitched roofs. On the northern wing a bay faced the platform. In their later years these LUR buildings, encrusted with soot, presented rather a grim appearance. 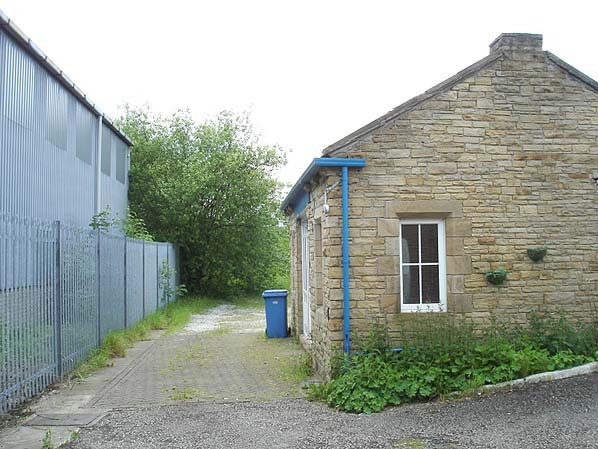 On the down platform, opposite the main buildings, was a stone-built enclosed waiting shed, also with a pitched roof. White Bear station’s goods facilities were located east of the up platform and included two sidings and a 4-ton lifting crane. The sidings connected to the main line to the north of the up platform. Passenger services ran between Wigan and Blackburn. On 16 July 1883 the LUR was vested into the LNWR and the line became LNWR/LYR Joint. The December 1895 timetable showed seven trains in each direction on Monday-to-Saturday. One of the up trains, the 8.50am to Wigan, stopped only when required. On Sunday there were two trains in each direction. 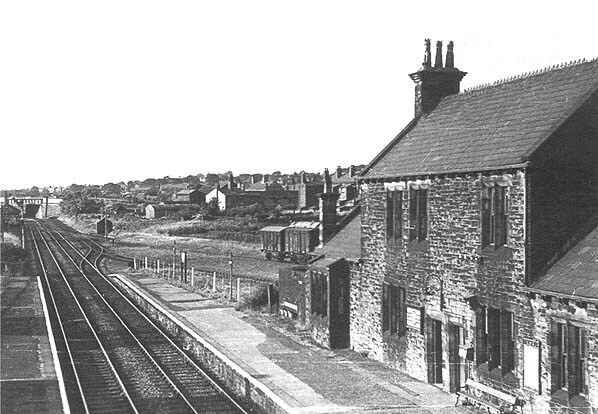 By this time a signal box had opened to the north of the down platform at the point where the goods sidings connected to the main line. The box was an LNWR Type 4 with a brick base and upper cabin. The Railway Clearing House Handbook of Stations 1904 listed White Bear as being able to handle general goods and livestock. On 1 January 1922 the line it passed into the sole ownership of the LNWR for a year before that company became part of the London Midland Scottish Railway (LMS) on 1 January 1923. The LMS fitted its distinctive ‘Hawkseye’ nameboards. The July 1922 timetable had shown eight trains in each direction on weekdays with no trains on Sunday. Ten years later the summer 1932 timetable also showed eight trains in each direction on weekdays. By the summer of 1947 the passenger service had reduced to four weekday trains in each direction. On 1 January 1948 White Bear became part of British Railways [London Midland Region] (BR[LMR]). The 1956 Handbook of Stations listed White Bear as being able to handle general goods and parcels. The 17 September 1956 to 16 June 1957 timetable showed that there were still only 4 trains in each direction Monday-to-Saturday. They ran between Wigan North Western and Blackburn. In the 1950s White Bear remained gas lit and retained the LMS nameboards. The ex-LUR stations between Chorley and Blackburn were given BR(LMR) ‘poster’ totems, rather than the standard vitreous enamel ones, but it is not known if this cut-price version of modernisation took place at White Bear. BR[LMR] closed White Bear completely on 4 January 1960 when the passenger services between Wigan, Chorley and Blackburn were withdrawn. In the mid 1960s the line was singled. In 1968 ex-LYR class 27 locomotive number 1300 (BR number 52322) was restored at White Bear station. An open sided shed was erected in the goods yard just to the rear of the up platform which protected the engine from the rain. 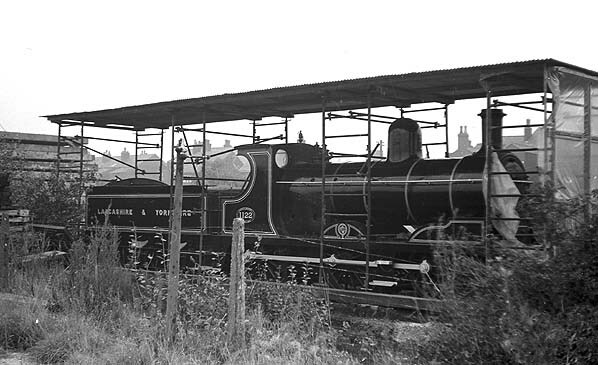 The locomotive had entered service in 1896 and was withdrawn from Lees Shed (Oldham) in 1960. The engine was purchased by Leonard Fairclough & Son Ltd who were based in Adlington. 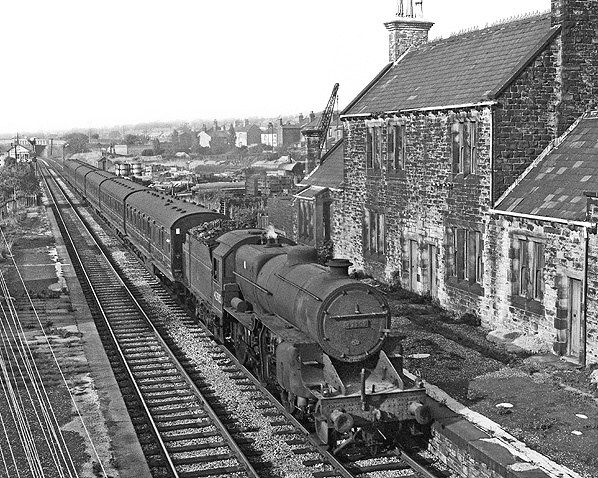 Goods services and passenger diversions operated up until 5 October 1971 after which the line officially closed. A 1974 Ordnance Survey map of the area shows the line still in situ. The up platform station building was demolished after closure but the down platform building survived and could still be seen in 2017 by which time the station site had become an industrial estate. White Bear station looking north in the 1950s. White Bear station shown on a 6-inch scale map from 1897. White Bear station shown on a 25-inch scale map from 1927. The up platform and station building at White Bear seen from a down direction train in 1957. The station goods yard can also be seen to the left. White Bear station looking north in the early 1960s after it had closed. Ex-LYR class 27 0-6-0 locomotive number 1300 at White Bear station in 1968. The photo was taken from the up platform and is looking east. One of the station lamp columns can be seen in the foreground. The engine was owned by Leonard Fairclough & Son Ltd at this time and they renumbered it as 1122. It had entered service with the LYR in 1896 and was withdrawn by BR in 1960. A view looking north at the site of White Bear station in January 1981. Looking south along the down platform at White Bear station in June 2007.